Feliz was born and raised in Taos. Her primary job is being a mother to an outgoing adventurous toddler! Feliz enjoys exploring the outdoors and sharing her love of gardening and nature with her daughter. She also enjoys baking and crafting, although there does not seem to be enough time for these things probably because she binge watches Netflix late in to the night. After graduating from Taos High School in 2001, she lived in Indiana for 4 years where she attended the University of Notre Dame (GO IRISH!!!) and obtained a BA in psychology and sociology. After which she spent a couple years in Denver. During this time, she taught elementary school and received a MA in elementary education from Regis University. In 2008, New Mexico called her back home. 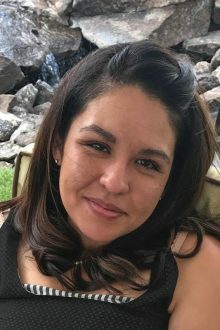 For the last 10 years she has lived in the Albuquerque area where she worked with families and children in different capacities, during this time she also received a MA in professional counseling from Highlands University. Feliz always knew that she wanted to raise her children in same community she was raised in so after the birth of her daughter in April of 2017 she was really called back home to Taos. She has been a home visitor since September of 2017 and is thoroughly enjoying the experiences and processes with parents. Feliz is a certified Circle of Security facilitator and would like to be certified in Infant Massage as well as receive her Infant Mental Health endorsement.